These cookies: they are AMAZING. 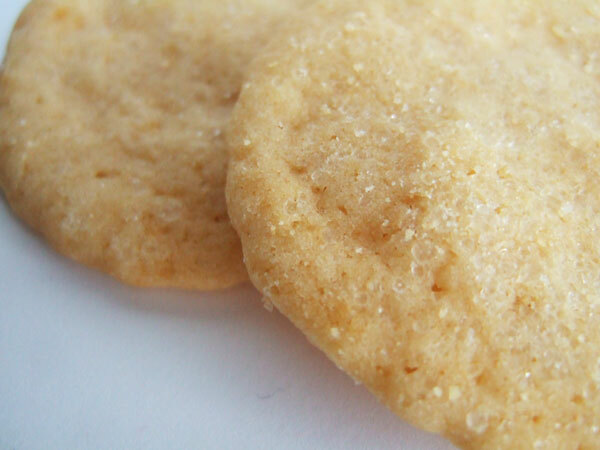 You will become addicted to Maple Sugar Cookies. You will NEED them. The original recipe can be found here, in the 1909 edition of the Good Housekeeping Women’s Home Cookbook. I love maple– not maple flavoring, but real maple sugar. The cookies use 1 cup granulated maple sugar plus 1 cup sugar; you can play with the proportions for a less sweet combo, but the general consensus amongst my taste-testers was that the sugar level was good. Rolled out thin and cut into shapes, these cookies bake up perfectly crispy, with a melt-in-your mouth buttery texture, and with an absolutely ideal maple flavor. Maple sugar, by the way, can be purchased off the King Arthur Flour website. 8 oz. is enough to make 1.5 recipes. I had never seen ground maple sugar before–it’s powdery and dusty and not at all what you’d expect. But a few dollops of maple flavoring are NOT a good substitution. If you want to make these, get the real thing. It’s imperative. Out of all the cookies I baked this season, these cookies were the hands-down favorites. Make them today. It will divide your life into the time before Maple Sugar Cookies and after. From The Good Housekeeping Woman’s Home Cook Book. Arranged By Isabel Gordon Curtis, c1909. Recipes adapted for the modern kitchen by Karen Lohman. 1. Preheat oven to 375°. Adjust rack to middle position. Line cookie sheets with parchment or lightly grease. 2.Whisk together flour, baking powder, and salt. 3. Cream butter and sugar with an electric mixer at medium speed until light and fluffy, two minutes. 4. Add vanilla and eggs, one at a time, beating until well combined, scraping down bowl after each addition. 5. Stir in ½ of the flour mixture just until combined. Do not over mix. Stir in the rest of flour mixture. 6. Chill dough until firm, 2-4 hours, or overnight. 7. Work with one quarter of the dough at a time. Return unused portion to refrigerator. Generously flour pastry board and rolling pin. Roll dough 1/8 inch thick, checking frequently to be sure dough is not sticking. 8. Cut with a shaped, 2-inch cookie cutter, dipped in flour. Place one inch apart on baking sheet. Bake at 375° for 9-10 minutes, until deep golden brown around edges. Cookies are fragile. Cool 3 minutes on baking sheets before moving to cooling rack. By the way, Four Pounds Flour is two years old! Thank you friends, old and new, for continuing to encourage me to write. The blog has grown so much in the past year and I have loved every moment. Writing here has changed my life; I hope, at least, it has been fun for you, too. 1. The modern version says to refridgerate the dough, the original does not. Was this implied back then? To chill it I mean, not necessarily in a fridge of course. Or are those using the modern instructions getting a benifit they didn’t even have the opportunity for in 1909? I guess what I’m asking is, if I don’t chill it first, am I going to end up regretting it? Obviously the “original” bakers didn’t have this in their instructions, and I’m torn between doing it their way vs. doing it a way that might yeild better results. 2. I was under the impression that a “quick” oven (original) was around 400 degrees, yet the modern instructions say 375. Was I wrong on my conversion, or has trying these cookies out proven that 375 is better? Chilling the dough will help you roll it out; I don’t know if it was implied in the original recipe or not. It is certainly possible to roll it out without chilling it, but it will be difficult. Terms like “quick” and “slow” can have no exact conversion; quick simply means a fast, hot fire. So if you’re cooking it in a wood oven, lose the thermomater, which they would have not been using. Use your eyes, hands, and nose. Build a quick fire and keep an eye on the cookies! Enjoy these cookies, they are delicious! And let me know how the turn out. I found this recipe while looking for a use for maple sugar i bought during a trip to Montreal Quebec. You are right. I now NEED these cookies. They are fantastic. I didn’t have any granulated sugar on hand but used course white sugar that I did have. They turned out great. Next time I will try them with regular sugar but the taste was delicious! Either way this will be a great regular cookie recipe. I will be making many more. I’m wondering if these cookies could be rolled into a log, chilled and then sliced thin and baked. Have you tried it that way? I have not, but I don’t see why it wouldn’t work, and it seems like it would be less fussy than cookie cutters. my problem would be eating all the dough before it was time to slice it! I too was thinking about making icebox cookies with this recipe and just before chilling roll the outer edge in chopped pecans, thus giving me two flavors I adore in one cookie. What do you think? I think that sounds delicious and you should let me know how it goes!